Andres Iniesta and Phil Foden. PHIL FODEN SAYS he should not be compared to Andres Iniesta as the former Barcelona midfielder is “on a different planet”. Foden is regarded as one of the most exciting talents in Europe, with the teenager starring in Manchester City’s EFL Cup win at Oxford United on Tuesday. The midfielder had a hand in City’s first and second goals against the League One side before completing the scoring himself, grabbing his first senior strike in added time. Oxford boss Karl Robinson suggested Foden’s style was reminiscent of Iniesta but opposite number Pep Guardiola played down such talk, keen not to pressurise the 18-year-old by comparing him with the Camp Nou legend. 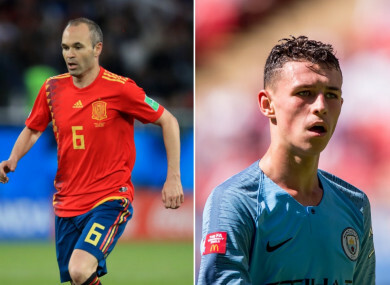 “I’m happy with that but come on – Iniesta is on a different planet,” Foden told reporters. “For them to call me that is massive, it means a lot. Tuesday was massive. While he’s only made two substitute appearances in the Premier League this season, Foden is happy to shadow his team-mates – including David Silva and Kevin De Bruyne – in training as he continues his development. “There’s no need to rush,” he added. “Pep knows what he’s doing and I’ll play at the right time. “He’s good at bringing youth players through; he’s done it in his career before so just be patient, I’m still young and I’m still learning. “Training with the likes of David and Kevin and seeing what they do every day has brought me on as a player and working with Pep as well has been a really big part of my game. Email “'Iniesta is on a different planet': 18-year-old Man City star rejects comparison to Barcelona icon”. Feedback on “'Iniesta is on a different planet': 18-year-old Man City star rejects comparison to Barcelona icon”.